The trial will be conducted at Toll’s ACE Training Centre in Bankstown, Sydney, and allow aviation training instructors to see where a student’s eyes are looking in real time, offering insights into a pilot’s situational awareness. “The advanced technology used in eye tracking is critical for evidence based training and our partnership with Seeing Machines provides the ultimate tool to equip our pilots, crewman and instructors with the highest levels of excellence in training,” Toll Helicopters general manager and former chief pilot Colin Gunn said in a statement on March 7. Toll Helicopters said it has been working with Seeing Machines, which develops computer vision technologies, on smaller trials over the past 24 months. It said instructors have been able to observe crew instrument and broader cockpit scanning in real-time in the full flight simulator and offered an “objective assessment of what their trainees are looking at”, such as speed tape, height, glide slope, heading, flight mode annunciator, at any given point in time during a flying sequence. “The information can be used to quickly identify scan breakdowns, missed information, CRM (crew resource management) attention distribution, and standard operating procedure / Flight Crew Operating Manual (FCOM) adherence or deviation,” Toll Helicopters said. 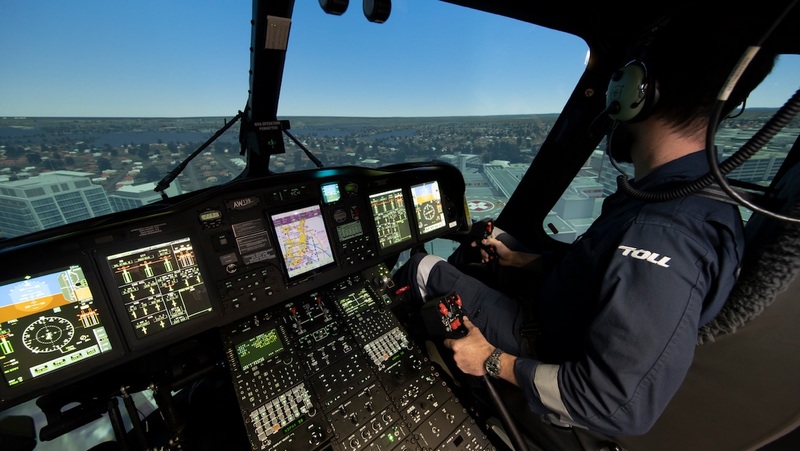 AW139 Standards Manager and Flight Examiner Darryl Humphreys said the technology would be a valuable asset for instructors and pilots. “For instructors, the ability to see in real time where a student’s eyes are tracking is remarkable,” Humphreys said. Seeing Machines general manager of aviation Patrick Nolan said the company was delighted to be trialing the crew training system with Toll. “As we move through the trial and progress to deployment of the technology more broadly, we have every confidence it will be instrumental in maintaining Toll’s high standards of safety and be key to enhancing pilot training efficiencies,” Nolan said. More broadly, Toll Group, which is part of Japan Post, said it had been installing Seeing Machines’ fatigue and distraction prevention technology on its truck fleet since 2008. There were currently about 1,200 vehicles with the safety device. In November 2017, Emirates said it had been working with Seeing Machines to better understand how pilots interacted and monitored instruments during certain identified real-time procedures that could potentially pose safety risks. The work was being undertaken through Emirates’ Human Factors Group and Emirates Training College. The June 2018 edition of Australian Aviation noted collaboration had involved multiple data collections in both part task trainers and in the A380 full-flight simulator. Further, Seeing Machines was working with several other carriers and had expanding to include rotary-wing work. There had also been interest in the development of military applications, specifically for ab-initio pilot training.